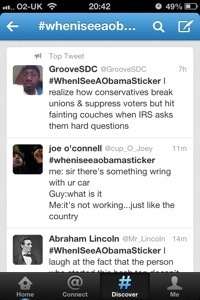 In case you’ve missed it, #WhenISeeAObamaSticker is now trending on twitter. This angers me, for a number of reasons. Firstly, it’s a bad hashtag – onerous and far too long. Secondly, the use of ‘a’ instead of ‘an’ before Obama is a terrible grammatical mistake that greatly devalues the weight of the anti-Obama arguments attached to the tweets. Thirdly, millions of morons across the world have used and retweeted the offending hashtag, spreading bad grammar even further through cyberspace. It hurts my eyes. If you’re going to create a hashtag, get it right, please.